Dark Chocolate Peanut Butter Ice Cream & A Giveaway! Decadent, dark chocolate peanut butter ice cream hugs sweet and salty peanut butter balls for the ultimate peanut butter and chocolate lover's dessert! Some things were just meant to be: Romeo & Juliet, bourbon & steak, and chocolate & peanut butter. Luckily for you (and me), I'm bringing you one of those lovely pairings to this very blog. Today is Chocolate Peanut Butter Day, hosted by Carla of Chocolate Moosey and Miriam of Overtime Cook. They've brought together over 30 talented bloggers bringing you all kinds of peanut butter-chocolate deliciousness. We'll be sharing our posts all over social media, so follow the hashtag #chocPBDay and be sure to check out all the recipes on our Pinterest Board! Plus, to thanks to our lovely sponsors, OXO, King Arthur Flour and Peanut Butter & Co, we've got some fantastic products to giveaway to three lucky winners. Enter below for your chance to win! This ice cream is rich and delicious. It's not for those who like light flavors or plain jane vanilla all the time. It's an easy way to step up your ice cream game without too much effort. The ice cream base is Philadelphia-style, meaning that it doesn't require eggs and it's not terribly fussy. 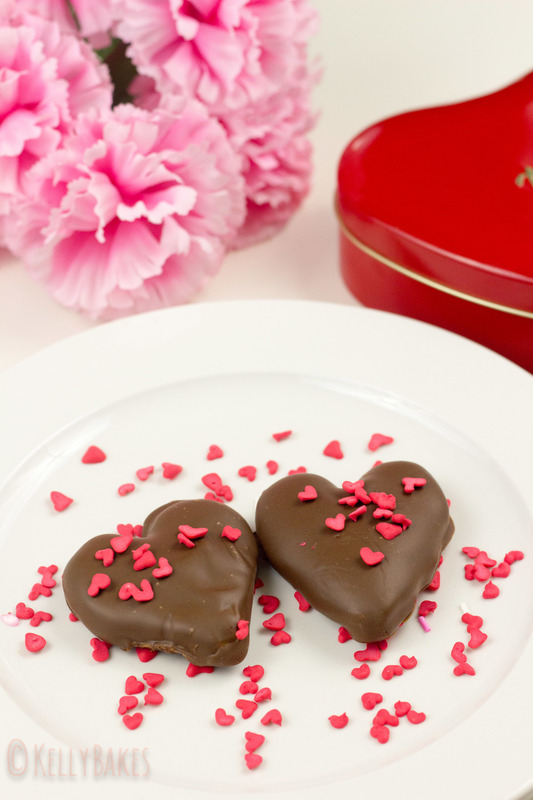 As if a chocolate peanut butter base wasn't enough, there are peanut butter balls scattered throughout and they're made with the same recipe as the filling for both my homemade peanut butter eggs and homemade peanut butter hearts. If you like peanut butter cups, you're going to love this ice cream so much you'll want to wife it up and put a ring on it. Promise. In a medium saucepan, heat the milk, heavy cream, cocoa powder, sugar, chocolate peanut butter, vanilla extract and salt over medium heat, stirring constantly. Once the sugar has dissolved and the mixture comes to a slight boil (it will have a steady bubble around the edges), remove from heat. [At this point, you can add it to a blender if you want a super-smooth base, but it should be fine as is!] Pour into a bowl, cover with plastic wrap and cool until chilled thoroughly. While the mixture is chilling, prepare the peanut butter balls by adding the creamy peanut butter and salted butter to a microwave bowl. Microwave in 30 second intervals until completely melted, being careful not to burn the peanut butter. Stir a few times before adding the nuts. Slowly stir in half the confectioner's sugar, working in 2 batches so as to not make a big ol' mess of your kitchen. Stir in the other half. You should have a thick dough at this point. Prepare a cookie sheet by lining it with wax paper or parchment. Grab a hazelnut or a nickel-sized piece of peanut butter mixture, roll into a ball and place on the lined cookie sheet. Continue with the remaining peanut butter dough until all the balls have been made. Freeze until ready to use. Once the chocolate peanut butter base has properly chilled, churn according to your ice cream maker's instructions. Once the mixture has been churned, scoop the mixture into a freezer-safe container and stir in the peanut butter balls and chopped chocolate. Freeze until set. Want more peanut butter-chocolate inspiration? Be sure to check out all the posts below! ...and now for the giveaway! Samoa Shots: boozy shots for the adult girl scout in all of us. I feel like I may have misled you a little bit because, truthfully, I was planning on giving you a shot anyway, I just wanted more reason to celebrate. More reason? you ask. Why, Yes! This brings me two exciting news part two! Autumn and I are back! You may recall in my last post how I mentioned my pal who is supremely talented at making all things cocktails? Well, she and I had been podcasting for almost a year and recently had to take a hiatus due to some pretty serious life-related stuff. Luckily, all is well and WEEE'RRREEE BAAAAAACKKK! Our podcast, The Alphabet Soup Podcast, returns tomorrow with our first new episode in nearly 4 months! For those of you who haven't listened before, we have two recoccurring segments, Cocktail Memoirs and Recipe for Disaster. The later usually involves meat, mayonaisse and/or jell-o and the former involves cocktails inspired by our weeks. On this week's show, Autumn and I are talking about Girl Scout Cookie shots and to celebrate, we thought we'd share our recipes with you. If you listen to the show, you know that Autumn always keeps it classy and brings her A game and I, well, I keep it real. We both made Samoa shots to celebrate our return, so be sure to head over to her blog, Autumn Makes & Does, for her take on Samoa shots (hint: it may involve jell-o shots)! Be sure to follow us on Twitter for latest podcasts and catch up all of our old episodes by subscribing in iTunes. SPOILER ALERT: These shots were inspired by super classy shots I did in college involving Hershey's syrup poured directly into your mouth. In the spirit of that, I also "toasted" the coconut with a kitchen blow torch in my bedroom blogging home headquarters at 11:45pm because I was too lazy to turn on the oven. You, dear reader, are of course classy and will use your oven to toast the coconut. Or, just use it straight from the package (I don't judge, clearly). Whatever method you use, please toast responsibly and not while under the influence of alcohol! Pour a tablespoon of chocolate syrup onto a plate. 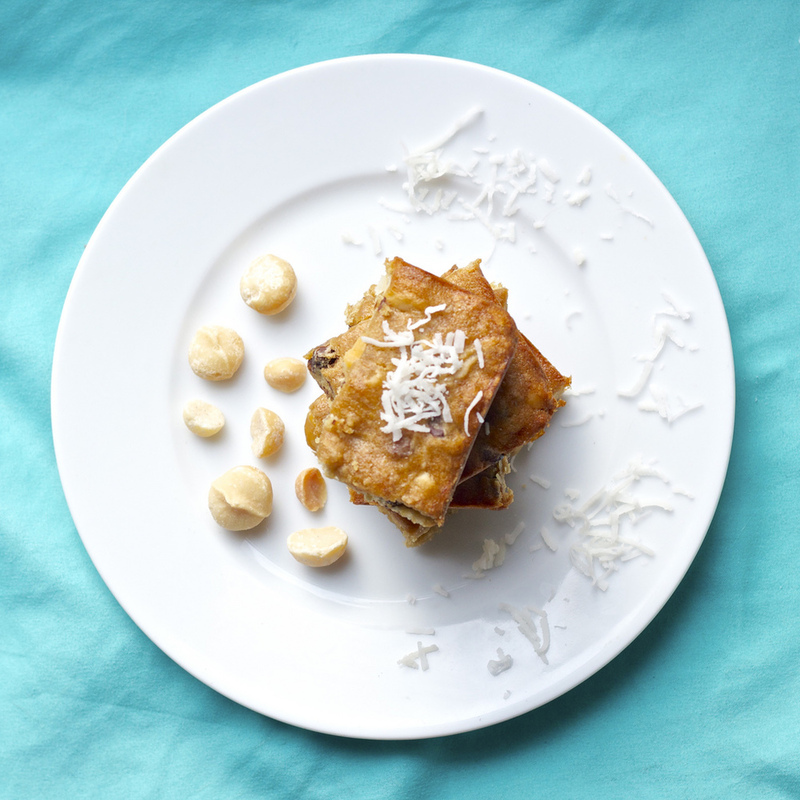 On another plate, pour a few tablespoons of toasted coconut. 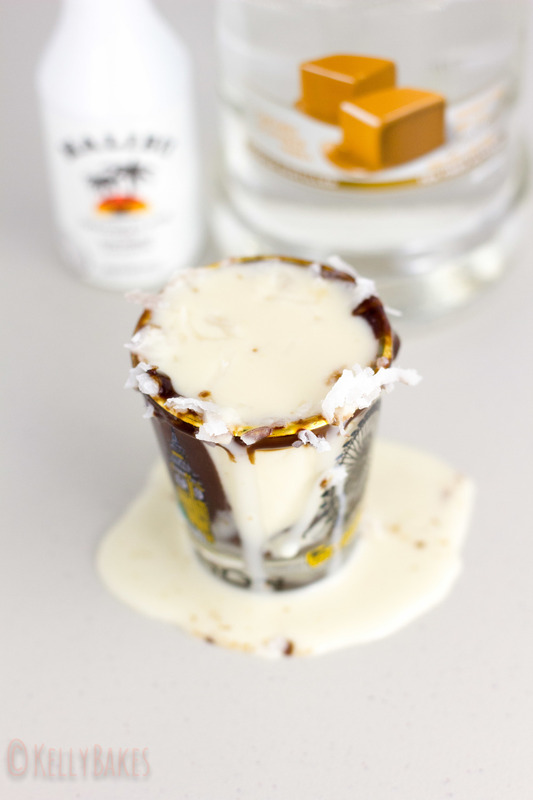 Rim a 1.5 ounce shot glass with the chocolate syrup and then immediately dip in the toasted coconut. Set aside. In a cocktail shaker filled with ice, combine the caramel vodka, Malibu and half-and-half. Shake and strain into the shot glass. Enjoy with your best gal pals.